I heard it from a source a week and a half ago that the ratings for the show were improving but the only stats I saw up until yesterday were for the premiere episode which were not very good. That’s almost three times the premiere episode’s ratings of 673,000. The stat that surprised me the most is the 7 share in women 18-34. I thought the number of female viewers would be a sticking point with the show but I was obviously wrong. These ratings are close to those of first run episodes of lower rated network shows such as the CW’s “Veronica Mars” or “One Tree Hill”. 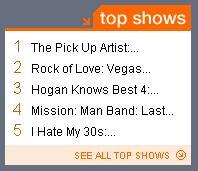 I also checked out VH1.com’s show charts this morning and “The Pick Up Artist” episode 6 is setting fat at number one. Debuting in the summer may have been more of a blessing than a curse after all. It will be interesting to see how the finale does when it is up against new episodes of network shows. I predict that Mystery will be back on VH1 in some form or fashion a year from now if not earlier. Oh yeah, I promise a new non-”The Pick Up Artist” post tonight.